The Henry Samueli School of Engineering kicked off National Engineers Week (E-Week)Tuesday with the Dean’s Breakfast at Engineering Gateway Plaza. E-Week is a celebration dedicated to not only appreciating the engineering profession but also making the profession better known among the community. The theme this year at UC Irvine is “Opening Doors Faster than the Speed of Light.” E-Week goes from Tuesday, February 21, to Saturday, February 25. The EngiTECH Career Fair, the premiere event of E-Week festivities at the Samueli School, presents an incredible opportunity for students and alumni alike to meet and speak with industry representatives and recruiters from prominent engineering corporations. Participating industry partners have the opportunity to speak with and recruit engineering students, while increasing their presence among students, faculty and staff at one of the top public universities in the nation. 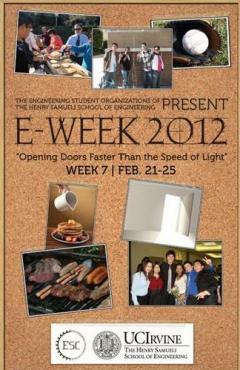 The events of E-Week are organized by the Engineering Student Council (ESC). ESC aims to represent and serve the students of the Samueli School. ESC acts as an umbrella group for the support and management of various engineering student organizations on campus. Dean’s Breakfast – 9:00 – 11:30 a.m.
EngiTECH Career Fair – 9:30 a.m. – 3:00 p.m.
Engineering Social – 6:30 p.m.
E-Week BBQ – 11:00 a.m. – 2:00 p.m.
High School Shadow Day – 10:00 a.m. – 2:00 p.m.
Student-Faculty Softball Game – 11:00 a.m. – 2:00 p.m. The various engineering student organizations will be hosting competitions from 10:00 a.m. to 4:00 p.m. Tuesday and Thursday at Engineering Gateway Plaza.